On 7th October 1914, some 8,000 soldiers of the Imperial German Army proudly marched into Ypres. They represented the vanguard of a nation hell-bent on claiming its share of empire, and although the Great War was still in its infancy, the notorious Schlieffen Plan appeared to be working as intended. Buoyed by their initial successes, the invaders treated the medieval city like any other place they had past through on their journey, on arrival demanding that thousands of loaves of bread be baked to feed the hungry troops and the city’s coffers be opened for the benefit of Germany. The following day, their bellies full of food and their pockets full of booty, they promptly left the city’s walled enclave to continue on their great march westwards. It was to be the last time that the German army would set foot in Ypres during the war, something that would ultimately lead to the deaths of almost 600,000 people and the annihilation of the city. The Germans, however, would not be the last foreign power to occupy the medieval citadel, for over the next four years Ypres would play host to some fifty different nationalities, as it increasingly became one of the central hubs of the war in Europe. Most of these diverse cultures were, at the time, still part of the empires and colonies of Britain, France, Belgium, Portugal, America and China, although many have since gained their independence. With such diversity in such a small place, it is logical to assume that many cultural elements from theses various nations were assimilated by the inhabitants of Ypres, making the small Flemish city one of the most cosmopolitan habitations on Earth. However, in 1915, the city’s population had been evacuated and the majority did not return until the hostilities had ended, by which time most, if not all, of the foreign powers had already left the area. The multi-national presence in Flanders during the conflict may not have left much of an impression on the area, but it left an indelible mark on the landscape surrounding the once beleaguered city. The destruction that was meted out on Ypres is hard to comprehend. It was said that after the war a man on horseback could see unimpeded from one side of the city to the other. There were no buildings left standing and the once magnificent Cloth Hall and St Martin’s Cathedral had been immolated, ground to dust by the relentless German shells that crashed down in rage for years on end, and when the guns finally quietened, this conflict landscape of the Great War continued to be contested. Winston Churchill wanted the city to be left as it was, a permanent memorial to the many British and Commonwealth troops that had perished there in defence of Belgium. But the former citizens, who were keen to return and rebuild their shattered community, won through and gradually the city was reconstructed as an almost exact replica of its pre-war self. It was an arduous task. During these early days of the new world, children played football in the streets with skulls as adults slowly cleared away the grim detritus of war. Houses were reconstructed and the magnificent Cloth Hall and cathedral were reanimated, a process that took until the 1960s. As Ypres rose from the ashes the echoes of what transpired there began to fade, and today, once again, it is a busy, bustling and vibrant city that appears as if it is hundreds of years old, even though there is not a building standing that is more than 95 years young. Despite these efforts, it was almost impossible to heal the wounds of the Ypres Salient. The area is home to many of the war’s most brutal battlefields: Passchendaele, Hill 60, Messines, Sanctuary Wood, Mount Kemmel and Hooge, to name but a few. The salient was not only one of the bloodiest parts of the Western Front; it was also one of the most unsuited to modern warfare, due to its flat and often boggy terrain. It is a commonly held myth that the machine gun was responsible for the majority of casualties during the conflict, but in reality it was the artillery shell. Mass produced in their millions, these harbingers of death caused appalling injuries and many men who were caught in their path simply ceased to exist, violently transformed into a red mist of ex-humanity. The damage the shells inflicted on the waterlogged, clay earth of Flanders’ fields transformed the farmland and villages into nothing more than a series of deep shell holes, which quickly filled with water. It was this combination of violated nature and technologically advanced weaponry that contributed not only to such abhorrent casualty rates, but also to a new phenomenon of warfare – the missing. At the end of 1918, as the battlefields receded, leaving vast landscapes of the dead, it was clear that the many missing had to be accounted for, and in 1919 initial planning work began on a monument to the missing of the Ypres Salient. 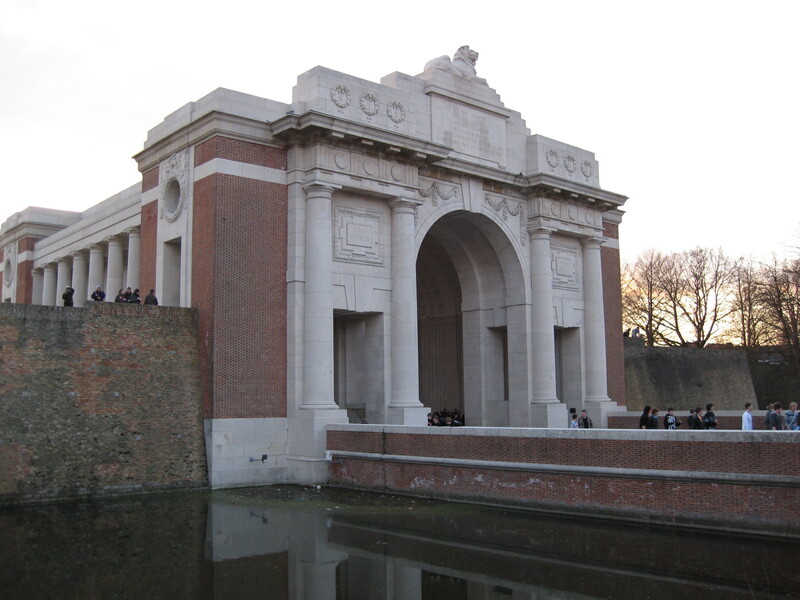 In 1923, Sir Reginald Blomfield’s design began to take shape, and on 24th July 1927 Field Marshal Lord Plumer officially inaugurated the Menin Gate. This magnificent structure, clad in glistening Portland Stone, is an object that now stands in for those lives that were consumed in their entirety by the war, and consequently it is far more than just a memorial. It is an object that contains and exudes enormous emotional power, not least because it has become the objectification of the entire conflict for the British. The incredible number of names that appear on the walls and staircases, encompassing a multitude of religions and nationalities, do not tell the whole story either, as those lost after 15th August 1917 are not represented. 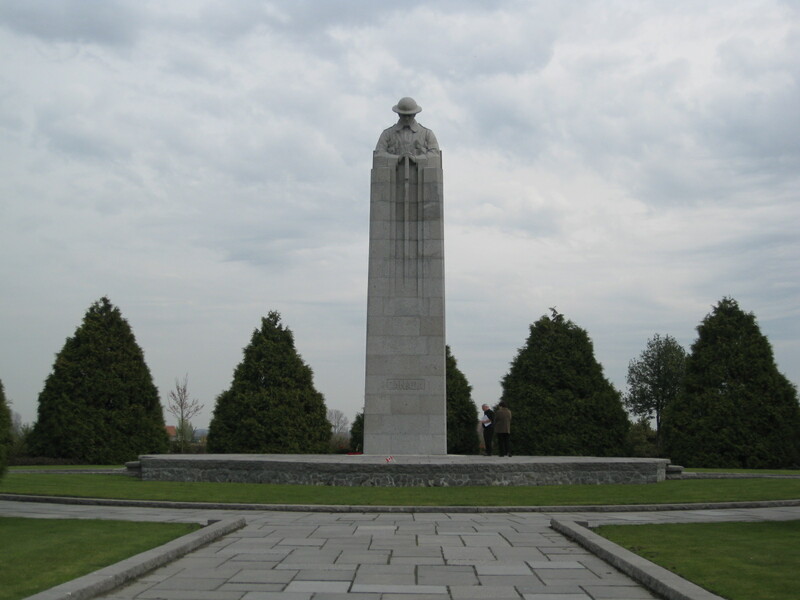 Nor are any Newfoundlanders or New Zealanders, as they have their own memorials at Beaumont-Hamel on the Somme, and Tyne Cot and Messines near Ypres. As imposing and dramatic as the Menin Gate is, it is only one of many objects in and around Ypres that describe the global nature of the war. The great Kaiserschlacht offensive of 1918 brought the Germans to within sight of the city and the limit of their advance is inscribed on the landscape by a set of modest markers, known as demarcation stones – permanent reminders of just how close Ypres, not to mention the entire salient, came to falling. The German presence can be seen in many other places, too. The many museums of the region contain a plethora of German weaponry and equipment, although this is only a fraction of the materiel that still lies beneath the fields, piercing the heart of the Belgian countryside. 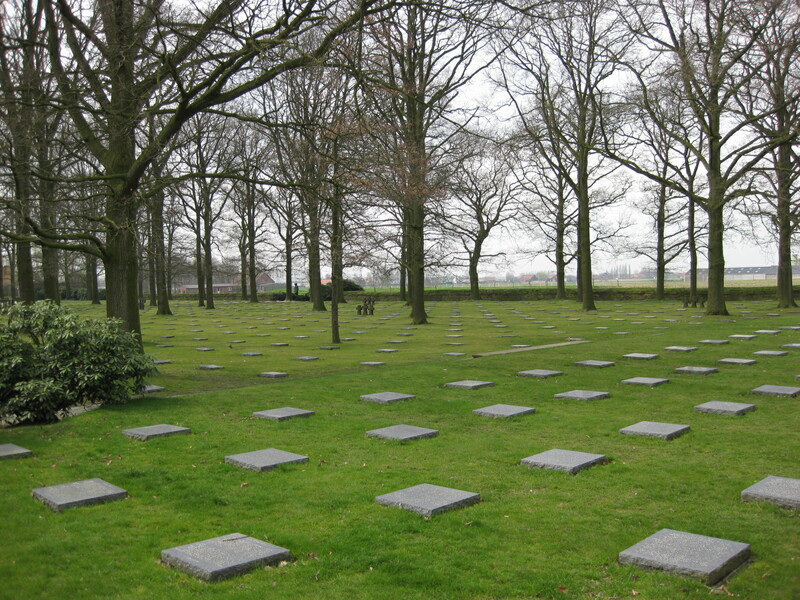 At Langemarck, just outside the city, is a large German cemetery, one that reflects in its design the Germanic relationship with nature and the environment, perfectly encapsulating Ernst Junger’s notion that when German soldiers died they became part of the ‘four seasons’. It is also the location of the memorial to the German missing of the salient and a mass grave containing some 25,000 soldiers. Rising high above the flat and level fields of Flanders is Mount Kemmel, a place bitterly contested due to its obvious strategic importance. 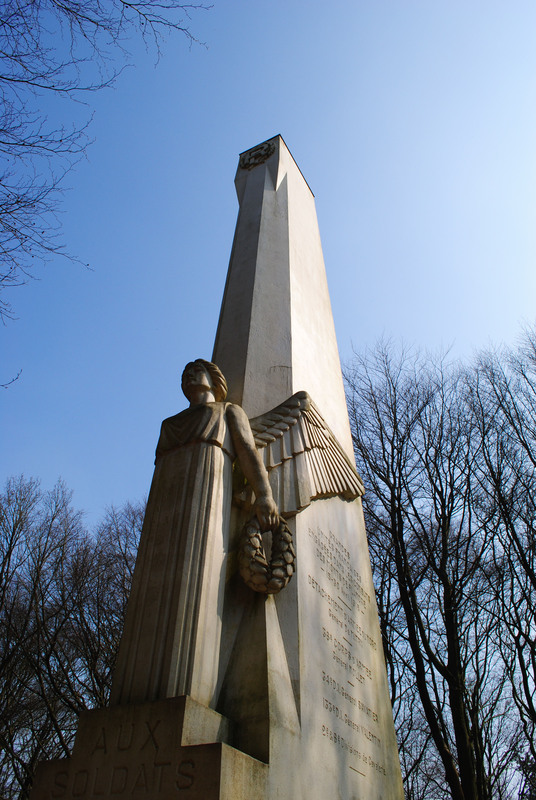 At the top of the hill can be found a large stone angel, which forms the basis of a magnificent memorial over 50 feet tall, commemorating the French casualties of April 1918. Further down the hill can be found an ossuary, the final resting place of 5,294 soldiers, the vast percentage of whom are unidentified. There are further memorials to the French located at places such as the Cloth Hall, the crossroads of the Langemarck-Boezinge road, and at the St. Charles de Potyze Cemetery. A memorial on the ramparts of Ypres commemorates the Indian contribution, and the American presence in 1918 is also remembered at the 27th and 30th Divisions’ memorial at Wytschaete. Nations from even further afield are also represented: for example on the city walls, in the small and peaceful Ramparts Cemetery, can be found the graves of ten Maoris, part of the New Zealand Maori Pioneer Battalion that served in the city. Siegfried Sassoon famously referred to the Menin Gate as a ‘pile of peace-complacent stone’ and indeed there are some who would like to see it removed entirely, but these sentiments are in the minority. For the Menin Gate is just one piece of the massed material culture in the area representing those who perished in the salient, and it is worth remembering that the size of a memorial has little to do with the scale of the commitment and loss that it represents. But Sassoon believed that memorials such as the Menin Gate legitimised the war, and he famously wrote in his poem ‘On passing the New Menin Gate’ that if the dead could rise, much as Longstaff depicted in his famous painting, they would deride the structure as a ‘sepulchre of crime’. Yet Ypres’ grand memorials can also be seen in a different light, one in the glow of which they do not glorify the war, but instead tell of the global effort that the conflict dramatically embraced. Often regarded as war between the British, French and Germans, the reality is that the First World War was a conflict so all-encompassing that even indigenous people from the depths of New Zealand became embroiled in the killing fields of Flanders and beyond, and to forget the importance of this international commitment could be considered the greatest crime of all. This entry was posted in Aftermath, From Space to Place, Material Culture, Strange Meetings, The Memory of War and tagged 355 (Military science), 900 (History & geography), 911 (Historical geography), 940 (General history of Europe), Blogs, distribution, Global Views, U (Military Science). Bookmark the permalink. 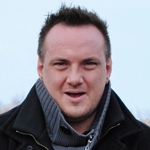 ← Erster Weltkrieg : What is it Good For ?